Oh yeah, lots of eating. And sweating, because of the 90+ temps. But also boating, visiting family and friends, fireworks, swimming, putt-putt golf, and the zoo. This giant tree house has a slide inside that little man loves. Visiting with T-Rex while in Dinosaur Adventureland. Checking out the cute dino babies. Having a Joey cross our path (no fence divides them from the public). Spying on a butterfly in the Flutter exhibit. And getting up close and personal with a giraffe. Wow all of that looks like so much fun! I think I'd even like the treehouse for sure!! Sounds like a great time was had by all :) The little kangaroo is just too cute! I'm so glad you had a great weekend! I love those pictures! Looks like fun : ) and the little kangaroo is adorable!! I love the long, lazy weekends that consist of much food consumption and happy smiles! SO AWESOME. love love love! so happy you had a great weekend!! Hey, our zoo doesn't have cute Joey's wondering about with the public. We have dinosaurs . . . though now they move and roar. Okay, that was a huge shocker for those of us (ME!!!) who didn't know they do that. What a fun weekend! Our temps were very unseasonably cool. I always love your pictures. It looks like you guys had a great time! I would like to live in that treehouse. Really, I would. ESPECIALLY since it has a slide. Very cool! My nephew would LOVE the dino thing. He got very upset with me this weekend when I joked that a rhino and a T-Rex were basically the same, "Potato, potato..." Did not go over well. Yup, I ate way too much food and probably one too many cocktails. I suppose that is what holidays are for. 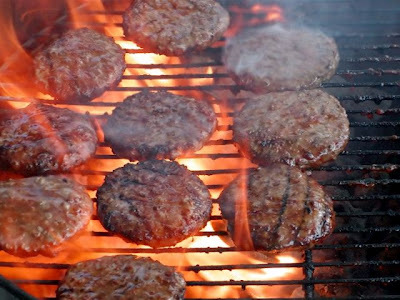 Great pic of those burgers, btw. Oh that joey! Too cute.